Lens or glass – it is up to you! Top Light Puk One LED: The design is up to you! 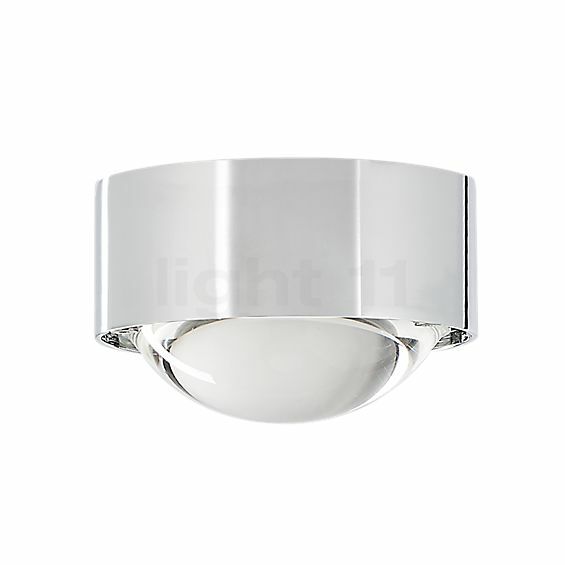 The Top Light Puk One LED is the technically advanced variant of the Puk One which is operated using halogen lamps. Its design is as simple as it is original: a cylindrical metal casing surrounds the illuminant, in this case the LED module. The light emission aperture is equipped with a sheet of frosted glass, a lens or an aluminium reflector. OR? Yes, that’s right. The design of the Puk One LED, such as the light emission, is entirely up to you. The appearance of the casing depends on your choice, as well. You may choose between matt and shiny chrome, matt nickel, white and black – all of this can be easily done via the light11 configuration tool. In the configurator, you may, furthermore, pick an optional colour filter. The Puk One LED ceiling light was designed by Rolf Ziel for Top Light. The ceiling lamp by Top Light Puk One LED emits its light directly downwards. If you have chosen frosted glass in the configuration, this German quality product emits softly diffused light. The matt lens provides a slightly more focused light emission, while the clear lens provides a clearly defined beam of light. If you equip the Puk One LED with an aluminium reflector, most of the light is bocked while some light escapes through the gaps to the side for a subdued illumination. If you would like to achieve an even more spectacular lighting effect, order one of the many optional colour filters that give the zone light an attractive hue, such as magenta. What always remains the same is the high energy efficiency of the Puk One LED, which is equipped with modern light emitting diodes and therefore convinces with high luminous efficacy and low power consumption. Tell other customers and us about your experiences with the Puk One LED ! The Top Light Puk One is often used in a corridor. While its lighting effect varies depending on the equipped accessory, it always succeeds in giving the room a pleasant brightness that ensures safe orientation. If a suitable ceiling outlet is available, it is also recommended for creating atmospheric islands of light in the living room, bedroom or dining room.